Marion Krauthaker, The University of Leicester, UK. Krauthaker, M. (2017). A survey of self-access foreign language centres in UK higher education institutions: Format, practices and challenges in 2016. Studies in Self-Access Learning Journal, 8(3), 223-234. This article reports on the observations and conclusions derived from a project which assessed self-access foreign language centres (SALCs) in UK higher education institutions between 2014 and 2016. The objective was to obtain a comprehensive picture of their structure, format and practices and uncover their current and anticipated challenges. The latter point was of particular interest in order to provide various stakeholders with useful pointers to accompany their potential reflections on SALCs and their future. The first stage was to conduct a field investigation of eleven facilities consisting of a visit of the structure and an in-depth interview of the managing staff. The data comparison and analysis then identified a number of emerging key points, such as space, equipment, staffing, mission, activities, financial resources and current arising issues. The findings presented here confirm the very uneven format of these facilities and reveal that, although their pedagogical benefits are widely accepted, SALCs currently encounter major challenges in terms of resources and support. This report can be of interest for a variety of stakeholders looking at the current position of SALCs in UK universities or having to reflect on the development or future of a facility. The idea to carry out a survey of self-access language centres (SALCs) in the UK arose from the observation that, in the second decade of the 21st century, great imbalances exist between these facilities in higher education institutions. While a handful of universities market state-of-the-art facilities, most SALCs seem to be found in the form of a couple of study rooms fitted with PCs or a few shelves and tables in the corner of a university library. In places, they simply do not exist at all or anymore. Research on SALCs has already explained this imbalance by the fact that self-access learning does not have the same seal of approval as classroom teaching and therefore lacks consistent backing (Gardner & Miller, 1999). Similarly, the move towards more virtual spaces through the impulse of new technologies and e-learning has been identified as a potential threatening force for physical self-access foreign language facilities (Mynard, 2012; Reinders, 2012). However, with widely proven and accepted pedagogical benefits and at a time where language contact hours are reduced to a bare minimum, it seemed important to push this investigation further. The following report describes the findings and conclusion drawn from a project carried out between 2014 and 2016 to obtain an up-to-date and comprehensive picture of SALC in UK universities and pinpoint avenues to reflect on their future. The methodology adopted was to carry out field investigations and conduct interviews to collect quantitative and qualitative data which would then be compared and analysed. From a simple Google search, I browsed over twenty UK modern languages departments and self-access foreign language facilities websites and selected a total eleven SALCs. This sample aimed to reflect the variety of facilities identified by Gardner and Miller in their typology and therefore ranges from “large scale” (full dedicated buildings) to “small scale” (a few dedicated shelves in a library), as well as “controlled” (manned) and “uncontrolled” (unstaffed) facilities (Gardner & Miller, 1999, p. 65; p. 20). In the following report, these facilities will be referred to as SALC 1 to SALC 11 to preserve confidentiality. I visited each SALC and conducted an in-depth interview with the manager or person in charge. An interview with the former manager of a discontinued SALC was also carried out, which brought the number of interviews up to twelve. I then analysed and compared the collected data, extracted key elements, and, where necessary, contacted the managers by email for follow-up conversations or to clarify and develop some information. In their typology of self-access, Gardner and Miller indicate that self-access is very flexible and therefore all facilities unique as they exit in a variety of environments and systems which suit their particular context (Gardner and Miller, 1999). Predictably, the visits confirmed that considerable variations in format exist between SALCs in UK universities. SALC 8, the smallest facility takes the form of shelves dedicated to language resources in a section of the main library demarcated by a different colour carpet. This reduced space contrasts greatly with that of SALC 3 which occupies an entire building and offers a series of activity rooms, language laboratories, classrooms, offices and social areas. SALC 5 also represents the other end of the scale as a full building with a large open space designed in corners and booth on the ground floor and with offices, classrooms and more specialised activity rooms adjacent and on the upper floors. The other facilities visited vary in size from a single medium size room (SALCs 4, 7 and 10), a series of rooms of various sizes (SALCs 1 and 11), large open halls (SALC 6) and large open spaces with adjacent small rooms (SALCs 2 and 9). In terms of staffing, apart from the uncontrolled facility (SALC 10) which has no staff, the facilities can be run by one single staff and by teams of up to twelve people. The visits allowed me to identify what can be considered as the ‘basic equipment’ offered by all eleven facilities (top part of Table 1). The management and maintenance of the basic equipment and resources, usually obtained as part of an internal or external start-up fund, is in all cases left to the appreciation of each manager. Because local decisions tend to be very different in each institution (depending on budget allocation, departmental structure, priority areas, languages catered for), a large variety of additional equipment and spaces can then be found in each facility (bottom part of Table 1). While some SALCs provide support solely for the languages taught as part of their degree (French, Italian and Spanish only for SALC 10 for instance), others cater for more than fifteen languages and are open to obtaining the necessary resources on demand for new languages (SALC 6). The supplementary equipment both reflects the focus of each facility and makes its originality. Finally, eight SALCs reinforce their support to learners through a human presence in the form of a language learning advisor (bottom row of Table 1) who acts as a link between classroom time and semi-guided or independent learning. The importance of trained and dedicated advising staff in SALCs is demonstrated by the proliferation of literature on advising. Research has shown that, in light of individual learning differences and the multiplication of online resources, educational approaches have to diversify not only within the classroom, but also beyond and notably through a focus on advising (Mynard & Carson, 2012). 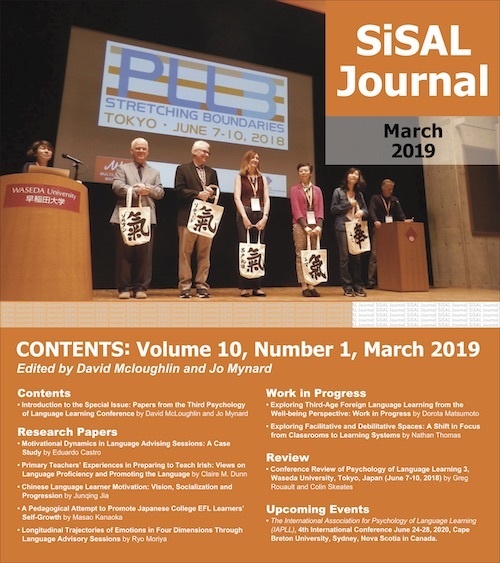 In the 2015 SISAL special issue on ‘Dialogue and Advising in Self-Access Learning’, Mynard and Yamashita stress how dialogue with learners transforms the learning space as a “site of engagement” where reflection can happen (Yamashita & Mynard, 2015, p. 3). The space for refection not only creates the right conditions to encourage autonomous learning, but it is also central for the advisor to review the ever-evolving needs of learners and initiate suitable upgrades. As explained by one of the managers: ‘The role of our counsellor in maintaining the attractiveness of the facility is also really significant, because [they are] the one who talks and spends time with our students every day and knows what’s happening in their learning path’ (SALC 6). Some of the facilities work actively on creating a language learning community within their walls to encourage students to spend more quality time within their walls. The literature on community-based access confirms the importance of this focus and attributes the rise in the number of regular users and an increase in achievement to “the staff’s success in providing a relaxed and supportive atmosphere” and “creating a community of practice” (Thornton, 2016, p. 298). Following the social learning movement which places great importance on interdependence and interactions (Murray, 2017) and therefore the role of SALC as a “social learning space” beyond the access to physical resources (Allhouse, 2015; Murray & Fujishima, 2016), different strategies are indeed used to make the visited SALC an attractive educational and social hub that language learners become more and more eager to visit. The first strategy used by the majority of centres concerns setting and location. Although this option is subject to building and space restrictions, seven of the centres visited have managed to gather all language related activities, people and spaces within the same area. Having a clearly demarcated ‘language zone’ on campus – whether on the same floor, building or within the same area – allows them to create a defined microcosm where the language is spoken, heard, read and written. The second strategy observed is to tighten the links with the learners through the presence of dedicated staff. Although restricted by budget, all but one of the SALCs visited employ at least one member of staff whose role is to welcome and guide learners. In the smallest facilities, the same member of staff sometimes doubles up as language advisor, a role which, as mentioned in the previous section, is considered as crucial for the success of SALC facilities (Carson, 2015; Gardner & Miller, 1999; Thornton, 2016). More generally, case studies have stressed that the main issue to consider for the success of SALC as a learning space is institutional approval to ensure the funding for full-time academic staffing (Carson, 2015). The visits confirmed that it is indeed an absolute priority for ten of the centres who make no compromise on this and guarantee that their learners are always welcomed by approachable staff at all time. Another important element in creating a lively community of language learners is to work on the ludic and social side of the facility (Table 2). Six of the SALCs visited offer a programme of activities organised to stimulate student interest in language. These range from language skills workshops, to daily news of the world gatherings, themed evenings, language cafés to innovative speed chatting and karaoke events. These extra-curricular events all contribute in making language learning fun and, even more importantly, fostering connections between learners: ‘the students come here to meet their friends too and, to me, the fact that they do other things here than learning a language is a success in itself’ (SALC 3). To enhance the attractiveness of the facility, three SALCs provide students with additional social zones. These take the forms of rooms (SALCs 1 and 11) and open areas (SALC 3) with equipment such as coffee machines, kitchenettes, pool table, table tennis table or even board games. One of the managers notices how ‘students hang out here and the place is just more alive. It is obvious to see that they enjoy coming here and find other things than just educational support’ (SALC 11). When the number of language students increased in the 1990s, SALCs became one of the responses to the resourcing difficulties by providing mass learners with the opportunities and skills traditionally available to smaller groups of learners. By encouraging student resilience and independence, SALCs promote the development of personal learning strategies and metacognitive knowledge (White, 2008) and cater for a greater variety of learners’ needs (Esch, 1994). The uncontrolled facility notwithstanding, all ten managers of a controlled facility state that their main objective is to support students in practicing and taking control of their language learning. In their own words, they all describe their centre as a dedicated and specialised environment where language is practiced among a physical community of learners and with specialised technologies, material and guidance. Through a SALC, students have more regular contact with the language and develop their own learning strategies with various degrees of independence. One of the managers explains that ‘the centre recreates more authentic and playful possibilities to listen, speak and practice written language and gives confidence and regular practice to students’ (SALC 5). The fact that SALCs give more motivation and chances for students to become successful in mastering a language was backed up by an investigation carried out at the Chinese University of Hong-Kong, which found that ‘there is a need for learners to come to a certain time, to a certain room’ in order to practice and study their target language (Fung-Kuen Lai, 1994). The social interactions made possible by the SALC environment are also shown to constitute the ‘right mix of linguistic, sociolinguistic, sociocultural and strategic competences’ needed for proficiency to take place (Alvarez & Garrido, 2001). Although SALCs are not authentic native environments, they undeniably constitute an immersive space where language linguistic, cultural and social encounters can happen. The first noteworthy issue arising from the in-depth interviews is that of the place and running of the facility within the home institution. Six of the centres visited function independently from the language unit of their institution. It is surprising to see that the majority of SALCs do not function in liaison with the institution’s language degree provider, but this confirms that there is a “particular philosophy within language departments which does not count language teaching among its main concerns” (Ife, 1994, p. 69). Three of the managers expressed a desire to work on closer pedagogical links with their language department and yet only three of the facilities work in full connection with their language department. SALC 1 is for instance in charge of delivering the credit-bearing language classes of the modern language department. SALC 7 is fully integrated in the language degree curricula through summative independent work to be carried in the centre. This work is set through a system of compulsory hour of SALC attendance towards the completion of assessed language portfolio. Students are familiarised with the use and benefits of SALC 7 during induction sessions in year 1. Thereafter, the centre becomes a key place where they carry out independent or guided work, submit their language work, take their oral and aural tests and work in connection with the language counsellor. A second issue stressed by nine of the managers is the lack of institutional and financial support. At one point or another, all ten controlled facilities have been threatened and have had to make important decisions to ensure their subsistence. In four cases, this has meant sacrificing the original link with their languages departments and finding ways to secure their own source of funding to avoid their discontinuation. One manager notes a ‘discrepancy between how the centre is talked about, I mean very positively, and actual practical support, and by practical I mean financial. Our centre is presented as having great pedagogical importance, especially during recruitment events, and yet there is no real investment in the facility’ (SALC 2). Latest research on the management of SALCs has indeed pinpointed the inconsistency between the recognition of the pedagogical importance of language centres and the minimal effort made to define and provide training for the management (Gardner & Miller, 2014). A prime example of this is SALC 10 which was abandoned after a start-up grant helped set it up and has since run as an unmanned facility receiving no internal funding. The mission, pedagogical use, and potential future of SALC 10 have not been identified at any level, and yet the home language unit markets the facility as a key space for language studies during open days. Behind the scenes, this uncontrolled facility is surviving thanks to the good will and time of some of the languages tutors who organise its running with the help of students and try to place funding bids to maintain or improve the facility. Overall, only three of the managers express that they feel confident that their facility will continue to exist and run in the future. SALC 3 is an unusual case in that it has benefitted from the full financial and moral support of its institution from the very start. The manager admits that this support is down to the individuals currently in charge in the immediate hierarchy, and explains that since they obtained a substantial start-up grant in the 2000s, the centre has been given a full dedicated building and ongoing funds to maintain it and employ staff on a permanent basis. Although the manager of SALC 3 has to make a case for additional one-off expenses, they usually obtain the funds needed to upgrade the facility according to learners’ needs and wellbeing. For instance, expensive soundproof glass doors have recently been installed to create a sense of space and harmony between the various activity rooms, while preserving the confines of each one. This is a rare case where a UK institution fully supports a SALC. Indeed, other facilities are supported in spirit, but have a lot more trouble justifying their legitimacy. SALC 5 also runs with confidence in their future but has gone through a long series of steps to become an independent accredited business. It now runs semi-independently from its institution, a necessary step to secure its autonomy. In comparison to the support of facilities which encourage autonomous experimentation and learning in other disciplines (such as labs in science departments), facilities such as SALCs in humanities disciplines struggle to convince and ensure their maintenance. All the facilities visited have had to find creative ways to ensure their continuation. Five of them have for instance joined forces with other departments, especially English language teaching units and therefore provide for English for international students, a more lucrative activity. Four facilities acquire their own budget by delivering a programme of non-credited language classes and embark on advertising campaigns to ensure that students keep coming through their doors. Because they do not benefit from central or national regulations, the majority of SALCs currently survive because they are backed by some individuals in the internal hierarchy. They are therefore at the mercy of restructuring. Changing institutional and planning priorities currently translate into the loss of valuable physical space and staff. The managers of four SALCs are concerned that this results in ‘unstable and precarious positions’ which are described as ‘a day to day preoccupation for most of the staff employed’ (SALC 4). The language advisor and sole remaining staff of SALC 8 feel that they still have a sense of identity as a language resource area, but explain that their facility was reduced over time as part of the institution’s strategy to ‘enhance the student experience’. Similarly, the former manager of a now disappeared structure indicates that ‘financial reasons, and by that I mean the university wanting to cut costs on non-recruiting areas’ (SALC 12) was the key reason to discontinue the facility. In this context, accountability is a key challenge for structures whose mission is not to increase the student population but to support the learning of existing students. All the facilities have to demonstrate at institutional level that “the resources (both human and material) are being well used and that results are being achieved” (Gardner & Miller, 1999, p. 80). Four of the facilities visited conduct regular evaluations by seeking staff and users’ feedback, keeping learners’ profiles and tracking progress records. They do so not only to assess and adapt to learners’ changing demands, but also to record and provide evidence of their achievements. As suggested by the former manager of a now disappeared centre, this is a way to claim the ‘maybe invisible and yet very real role we play[ed] in giving students their confidence back and certainly in preventing them from falling behind’ (SALC 12). From eleven visits and twelve in-depth interviews, this project has allowed me to better grasp the current landscape of SALCs and to identify the current challenges encountered by these facilities. SALCs are varied and pedagogically meaningful facilities: they constitute a dedicated and safe physical environment where students can study and practice a foreign language. By offering specialised technologies, resources, human guidance and a variety of learning methodologies they adapt to a wider-range of students and can be seen as champions for learning accessibility. They also have a strong cultural, intercultural and social role to play and have the potential to enhance a variety of personal and transferable skills for students. However, these units do not add to the student population. Their principal challenge currently lies in the uncertainty of their future or, at the very least, the energy to be spent in a constant battle to justify their existence. By exposing an urgent need to research, rethink and claim the values of SALC, this project hopes to become a useful starting point for further research on SALC. It should also be of interest for a variety of stakeholders looking at the current position of SALC in UK universities or having to reflect on the development or future of a particular facility. Marion Krauthaker is a Lecturer in French and Francophone Studies. Originally specialising in gender studies and literature, her position of Languages Coordinator at the University of Leicester led her investigate Modern Languages as a discipline and, in particular, pedagogical issues linked with the learning of a language in the current neoliberal educational and political UK context. Alvarez, I., & Garrido, C. (2001). Strategies for the development of multicultural competence in language learning. In J. A. Coleman, D. Ferney, D. Head & R. Rix (Eds. ), Language learning futures: Issues and strategies for modern language provision in Higher Education (pp. 150-163). London, UK: CiLT. Esch, E. (1994). Self-Access and the adult language learner. London: CiLT. Fung-Kuen Lai, E. (1994). Keeping contact with learners. In E. M. Esch (Ed. ), Self-access and the adult learner (pp. 146-151). London, UK: CiLT. Gardner, D., & Miller, L. (1999). Establishing self-access. Cambridge, UK: Cambridge University Press. Ife, A. (1994). From continuing to higher education: Open-access learning at Anglia Polytechnic University. In E. M. Esch (Ed. ), Self-access and the adult learner (pp. 68-72). London, UK: CiLT. Murray, G., & Fujishima, N. (2016). Social spaces for language learning: Stories from the L-café. Basingstoke, UK: Palgrave. Mynard, J., & Carson, L. (Eds.). (2012). Advising in language learning: Dialogue, tools and context. Harlow, UK: Longman. White, C. (2008). Language learning strategies in independent language learning: An overview. In T. W. Lewis & M. S. Hurd (Eds. ), Language learning strategies in independent settings (pp. 3-24). Clevedon, UK: Multilingual Matters. The original sample included only six SALCs but I was eventually able to visit a total of eleven facilities thanks to the generous funding awarded by the University of Leicester ‘College Of Arts, Humanities and Law Teaching Development Fund’ and the Leicester Learning Institute ‘Teaching Enhancement Fund’ and ‘Travel Fund’. A more extensive critical evaluation of the place of SALCs in the midst of the ongoing tension between pedagogical needs and neo-liberal imperatives is currently carried out by the author and will be published in 2018.